Ricoh confirmed that they will be adding video chat and other cloud-based features for the Ricoh Theta S.
A few months ago, Ricoh hinted that they would be adding “video communication” to the Ricoh Theta S and other cloud-based features. It didn’t happen in April or May and it’s now almost the end of June, and this feature still hasn’t been added, naturally raising the possibility that the idea was nixed. 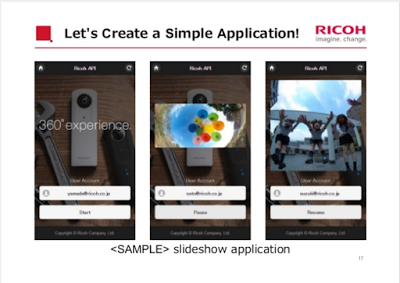 However, Ricoh released a presentation to developers that confirmed the video communication. They also clarified that it would be a two-way video chat. 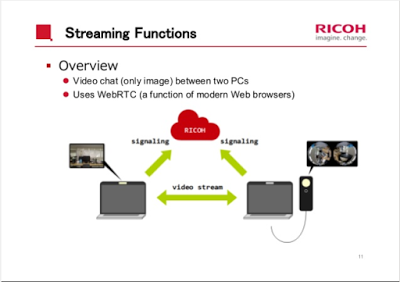 In the slide below from the presentation, Ricoh showed that the video communication would be a video chat between two PCs, not just a livestream. This could be useful for a video conference for example. A group of people could be seated at a conference table​ with a Ricoh Theta S providing a 360 view. The other party could then have a video chat with them using his own webcam. It could be useful also for video chats with family or friends. I think we can expect to see features similar to other cloud-based photo gall​eries, such as the simplified photo editor on Google Photos. HERE is the official presentation. For 360 degree video calling,conferencing one can use https://www.vrlively.in .It allows a user to make video calling in virtual reality. Share your 360 photos and videos to any browser with Spinnable!